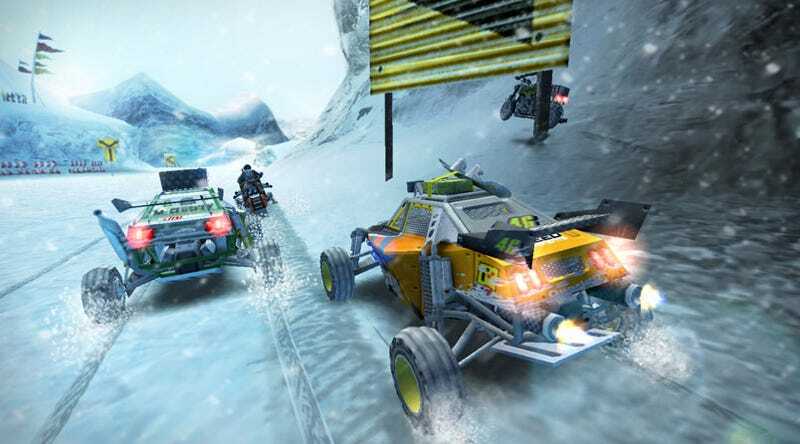 Sony's MotorStorm series is making the move to the PSP (and PlayStation 2) later this year, trading in sun, sea, and sand for snow, with MotorStorm: Arctic Edge, Bigbig Studios frenzied frosty sequel. Sony showed off the latest version at its most recent PlayStation Gamers Day, giving us hands-on time with the PlayStation Portable entry, which did an impressive job of capturing the feel of the previous entries, MotorStorm and MotorStorm: Pacific Rift, just on a smaller scale. Normally, I can't tolerate ice levels, but Arctic Edge seems surprisingly capable, a testament to Pursuit Force developer Bigbig's PSP prowess. MotorStorm: Arctic Edge is an on-the-go version of the over-the-top multi-vehicle racing series that does for snow what the first two MotorStorm games did for dirt and mud. The visual fidelity is obviously nowhere near its PlayStation 3 predecessors, but little else seems to have been sacrificed. Arctic Edge supports up to 8 players in ad hoc wireless mode and adds snowmobiles to the vehicle lineup. I played through two of the game's tracks, Wolfpack Mountain and Ascension, testing out the new snowmobiles and the big rig. It was a strictly single-player affair. Good question. The game's release date is still officially TBD and the dev kit build we were working on was clearly in the alpha stage of development. Only a couple of tracks were playable. Visual Information: Arctic Edge, because it's set in so much snow, delivers a lot of white, gray and brown to the LCD screen. It may just take some getting used to, but the layout of each course was a little difficult to sort out, especially at high speeds. Bigbig has tried to offset some of this by using brighter colors for signage and other markers, but it was a little visually confusing. Crash Physics: I crashed. A lot. And I used to be rather good at the original MotorStorm, so it was a tad frustrating. Occasionally, explosive crashes happened during unexpected nudges with the environment, a problem that reared its head when playing pre-release versions of the original MotorStorm. That may just take some collision detection tweaking—or maybe just a bigger dose of racing skill. The Feel: Arctic Edge unmistakably feels like a MotorStorm game, even if it doesn't carry some of the same bells and whistles of its bigger brothers. It's speedy, maybe a little too barren, but looks like a respectable portable version of the previous games. The Color Scheme: Bigbig has gone bold for the Arctic Edge interface, using bright magenta, cyan and yellow throughout, helping menus and on-field items stand out. That's a good start, but could still use a little tweaking, to make track paths easier to suss out. They'll probably take some flak for their retro choices, but I dig it. MotorStorm: Arctic Edge may lack the visual fireworks of its forebears, but its still a solid-looking racer. Can we just cool it with the pre-rendered MotorStorm trailers please?